The Maranacook boys and Richmond boys and girls all face record holders today in state championship soccer games. Maranacook takes on the state’s career goal scorer, Madawaska’s Ian Lee in the Class C state championship game at Hampden Academy while the Richmond boys tackle a team in Bangor Christian that has won four straight Class D state titles and a state-record 60 games in a row. The Richmond girls meet Washburn for the second year in a row for the Class D title and must contend with 50-goal scorer Mackenzie Worcester. The Class D games are at McMann Field in Bath. Girls: Windham vs.Bangor, 10 a.m. Boys: Hampden vs. Scarborough, 12:30 p.m. 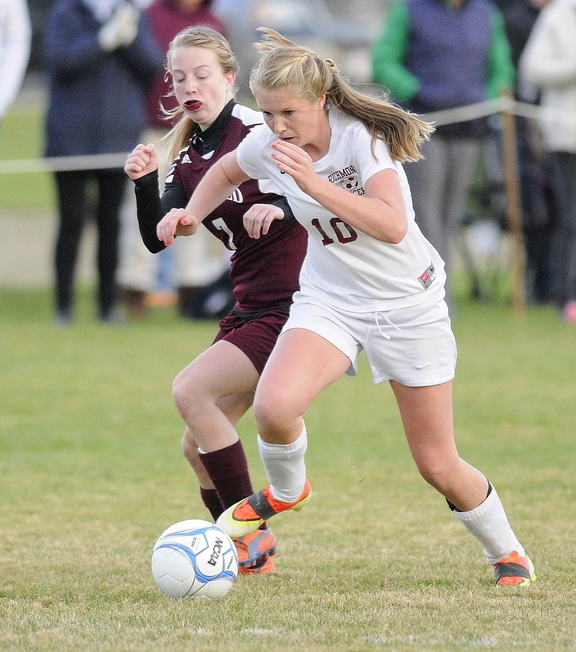 Girls: Cape Elizabeth vs. Waterville, 3 p.m. Boys: Greely vs. Camden, 5:30 p.m. Girls: Waynflete vs. Orono, 10 a.m. Boys: Maranacook vs. Madawaska, 12:30 p.m. Girls: Washburn vs. Richmond, 3 p.m. Boys: Bangor Christian vs. Richmond, 5:30 p.m.
Staff photo by Joe Phelan Buckfield's Ashley Campbell, left, tries to stop Richmond's Kelsea Anair during soccer playoff game on Wednesday November 6, 2013 at the Richmond High School. Lee has 38 goals this season and 127 for his career, breaking the record of 107 set by Bangor Christian’s Bradley Wilcox two years ago. They include Jake Gendreau, who has 11 goals and 13 assists and center half Sam Cyr, who has 10 goals. Coach Gendreau said he hasn’t seen Maranacook play this season. Maranacook coach Don Beckwith saw the Owls play at midseason and noted a contrast in style in that his team plays more of a possession game. The Black Bears don’t have one prolific scorer but several players who can put the ball in the net led by sophomore Kent Mohlar with 15 goals. Alec Daigle and Taylor Wilbur each have 12 goals while Nick Lacasse has 10. “I think they’ll have just as hard a time matching up with our guys as we do with theirs,” Beckwith said. Madawaska (16-1-0) played in the Class C finals in 2004 and 2007, losing both times. Maranacook (15-0-2) , which played in Class B last season, has never reached a state final. Bangor Christian (17-0-0) has played Richmond (13-2-2) three times in the state final, winning all three games, the most recent in 2010. This year’s Richmond team is relatively young and inexperienced but has grown throughout the season. Nate Tribbet leads the Bobcats in scoring with 16 goals while younger brother Cody has 11. Bangor Christian has 10 seniors on the squad, several starting for the first time. The Patriots have a balanced scoring attack led by Jay Bishop with 23 goals. Kyle Holmes has 17, Brandon Messer 16 and Tucker Rice 10. The Richmond girls (16-1-1) graduated several players from the team that defeated Washburn 2-1 in penalty kicks last year for their third state title in a row. Washburn returns several starters form last year’s team, including Worcester who scored her school-record 50th goal in this week’s Eastern Maine championship game. Junior Amber Loon leads the Bobcats in scoring with 25 goals while sophomore Kelsie Anair has 23 and freshman Meranda Martin 15.